The VOICE, OUR VOICE will forever be OURS and can never be silenced!!! 20 years of active resistance by The VOICE Refugee Forum in Germany is a proof that self-organization of the affected persons is the only alternative for the struggle of the oppressed. It is our aim to fight and end the fear and insecurity of being a refugee here in Germany and Europe as a whole. Founded in 1994 in Thuringia Germany, we, The VOICE Refugee Forum invite you to join us in celebrating 20 years anniversary of refugee self-organization. 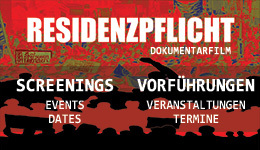 It is a call for solidarity with grassroots political activism and struggles in Germany and beyond. This Anniversary will be funded only by internal and independent donators to guarantee the autonomy of our resistance. Our aim has been to fight societal and institutional racism, discrimination and other deplorable and inhuman conditions that refugees are subjected to in Germany. This has been against the backdrop of refugees and migrant rights abuses that are institutionalized through racist laws legitimizing the brutality of the State organs – this, the network of “The VOICE” has been relentlessly confronting since its 20 years of daily engagement and self-empowerment for active resistance. The anniversary will reflect on the celebration of the longest self-organized refugee movement in Europe and the endless struggles to break the ingrained German state isolation culture and liberate ourselves and the society from the daily discrimination we face in Germany! This celebration is about ‘You’ as much as it’s about ‘Us’, and hence it’s about our solidarity, our principles, our strength and the victories attained from challenging the injustices we face from the hypocrisy of the political elites and their cohorts who still live in denial of our inalienable rights to human dignity. We celebrate while reviving and reliving the memories of our contributions to the refugee struggles. Remember, the history of our solidarity cannot be complete without acknowledging the sacrifices of the still living and the dead refugees who inspired our survival over the last two decades. Engraving this acknowledgement in our hearts fortifies our strength and aids our success of standing together against the globalized patterns of Imperialism and colonial injustice. Our persecutors have attempted to divide and rule us, but we have blown their strategy in their face by standing together as a refugee group, united by our principles of justice and equality. Their attempt to intimidate us has failed as we have only become more determined and resolute to stand up for our rights. Their attempt to silence us by cruel and inhuman means has left our voices louder than they can bear as we continue to inspire others to raise theirs. “We are here because you destroy our countries” a slogan of the Caravan-for the Rights of Refugees and Migrants aptly describes the mechanism of Neo-colonialism that has forced many to live as refugees within and outside our home countries. The meaning of this thought-provoking slogan is reflected in the innumerable examples and means through which Western economic and political interests are destroying our lives and home countries. We are calling on you to share your inspiration with us. Together, we are inspired to continue our struggles to expose the injustice of the nations, their participation in and making of wars and exploitation because these are the major reasons that force us to flee and migrate from our home countries. In Germany and beyond, refugee struggles in many cities presently feeling the brunt of our long years of refugee resistance in Europe. The 20 years anniversary of The VOICE will be marked with five days of socio-cultural and political events from Wednesday 1 – Sunday 5 October 2014 in Jena. Once again, we shall reflect on the refugee right to freedom of movement and settlement as well as the importance of continued self-organization of refugees by focusing on identifying and defining criminalization through persecution: Main emphasis will be laid on the analysis of deportations as a crime and the atrocity of deportation prisons. Rally from 3 to 5 pm.